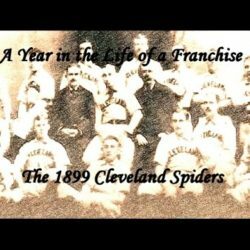 It started with the Cleveland Spiders in the 1890’s. They had been a decent team until their owners purchased a second team which was the St. Louis Perfectos in 1899. The owners decided they wanted to excite the fan base in the new city so they dumped their roster from Cleveland to St. Louis. The Spides were really bad as they lost 11 games in a row 6 times during the season and their best pitcher was rookie Harry Colliflower. He won one game and lost eleven times. Once while in Cincinnati while staying at their hotel, they talked a local tobaccoist named Eddie Kolb to be their starting pitcher for the next game. He lost 19-3. Fans began staying home and not attending the games and the locals quit calling them the Spiders and smacked the nickname “Exiles” or “Wanderers” as the team name. The team had a final recordd of 20 wins and 134 losses. Baseball executives and league brass began a move to outlaw owning more than one team. 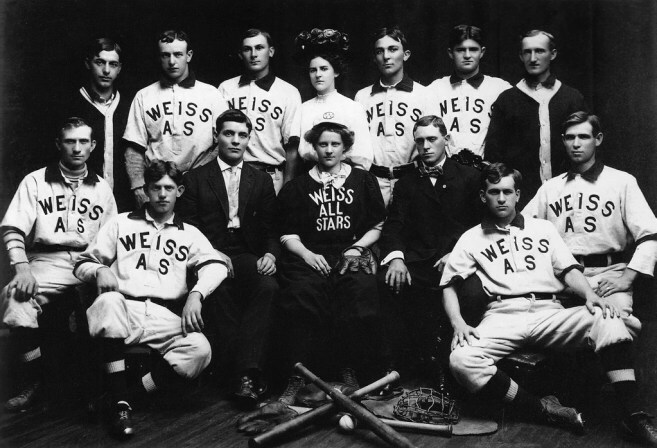 At the conclusion of 1875, the organization was known as the National Association of Professional Base Ball Players (also known as NA) disbanded as it was known as a conglomerate of drunken players, rowdy men, corrupt and mismanaged businessmen and under the influence of gambling. But the fact remains that after five seasons, they ran out of money. 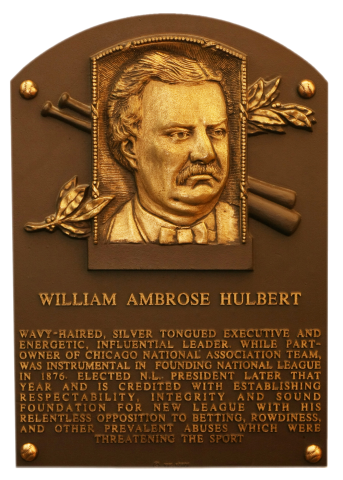 A Chicago businessman, William Hulbert, began the process of forming the National League of Professional Base Ball Clubs (also known as NL) on February 2, 1876. He was the owner of the Chicago White Stockings, which were also known as the Chicag0 Cubs. He put together some new rules that any team that wished to join must have at least 75,000 people or more. He set up the league with eight teams and each team between April 22 and October 21 would play seventy games. 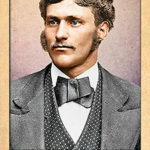 He was born on October 23, 1832, in Burlington Falls, New York and at the age of two years, his family moved to Chicago. That would be his home for his entire life except for the period of time when he attended Beloit College. His in-laws had a very successful grocery business and he expanded the business into the coal trade. It was from this that he became a very rich person. He became involved in 1874 with the Chicago White Stockings when he became an officer on the Board of Directors. There would be eight teams in the National League which included the Chicago White Stockings, Hartford Dark Blues, St. Louis Brown Stockings, Boston Red Caps, Louisville Grays, New York Mutuals, Philadelphia Athletics, and the Cincinnati Reds. Ten days after the formation (February 12), Chicago was the first to announce that they had signed Albert Spalding as a player on their team. Shortly after that, Spalding announced he would start a sporting goods store in Chicago and called it Spaldings. On April 22, 1876, the first National League game was played and the Philadelphia Athletics were victorious over the Boston Red Caps 6-5. In that game. Joe Borden was the winning pitcher and the first base hit of the league went to Jim o’Rourke. Pitcher Albert Spalding threw the first shoutout on April 25th as Chicago won 4-0 over Louisville. It was a doubleheader and Spalding tossed another shutout in game two. The first National League home run was an inside-the-park homer on May 2nd from Ross Barnes of the White Stockings. 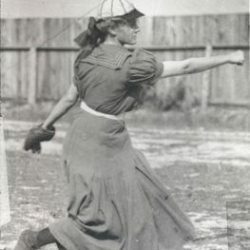 The game was against the Cincinnati team and the pitcher that allowed the first home run was Cherokee Fisher. There was a triple play on May 13 as the Hartford club pulled it off the Hartford Dark Blues. Also in May, the first tied happened on the 25th of the month between the Louisville Grays and the Philadelphia Athletics. With two months in the books, some events that took place in June include George Hall of the Athletics hitting two home runs in the same game as his team defeated the Reds 23-15. Davy Force has six hits in six at-bats on June 17 to lead his team to a 14-13 win over Chicago and Albert Spalding. 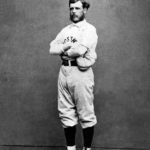 The first no-hitter was in the books on July 15, 1876, when George Bradley of the St. Louis Brown Stockings won 2-0 at St. Louis Grand Avenue Park over the Hartford Dark Blues. 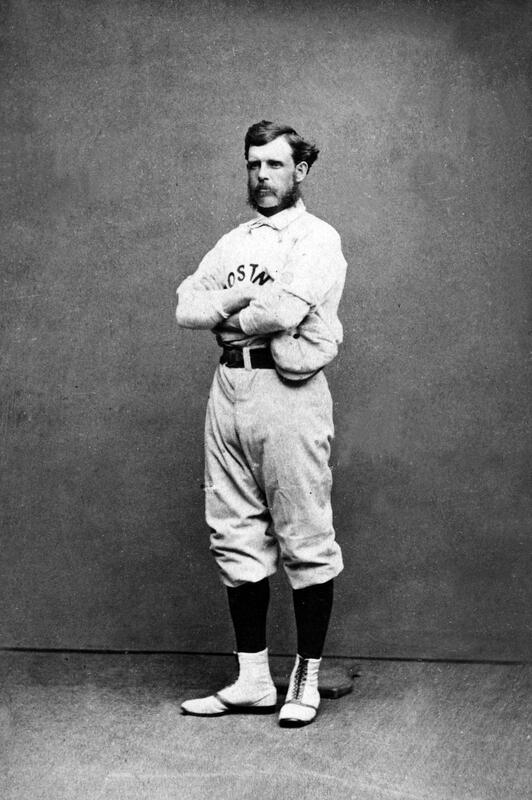 Cal McVey of the White Stocking garners six hits in a game which now totals 15 hits in three games, and 18 hits in four games which tie his own record. On August 22 with the game tied, a St. Louis hitter smacks the ball down the third base line and hits one of his teammates. The umpire rules the runner can score and Chicago makes a protest and leaves the field. Now the umpire rules the Brown Stocking the winner of the game. On September 11, 1876, the Philadelphia Athletics quits the league due to financial concerns. Five days later, September 16, the New York Mutuals do the same thing and inform the league they will not travel west for the final trip of the year due to financial constraints. The Chicago White Stockings clinch the pennant on September 26 with a 7-6 win over Hartford. They finish the year with 52 wins and 14 losses. In the second place, the Hartford team is 47-21, followed by St. Louis at 45-19 and Boston with a 39-31 record. The other teams all finish under the .500 mark. The Chicago Tribune published, on October 23, 1876, a section in their paper which included stats for the year. This is the first known instance of this happening. At the end of the year meeting on December 10, the New York team and Philadelphia squads are expelled for not finishing the season. 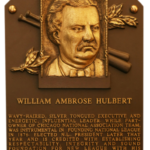 Also, at that same meeting in Cleveland, William Hulbert was elected President of the National League. Harry Wright knew he could make money by putting a baseball team together. He was a ballplayer himself that once hit seven home runs in a game. 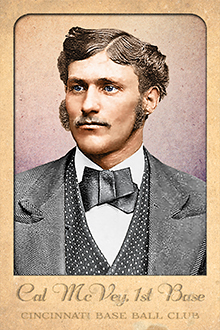 He convinced a group of Ohio investors, in 1869, to finance the team and he was named manager. Wright was sure that he could get people to pay 25-50 cents to see a game. Afterall, they paid a dollar for the theater. In Wright’s world, he wanted his players to be professional on the field so he paid them and then he drilled the fundamentals of the game into their head. He also desired that players remain silent on the field and act like businessmen. The team was supplied with knickers for pants as that would help their speed. The majority of the players came from New York but were relocated to Cincinnati. 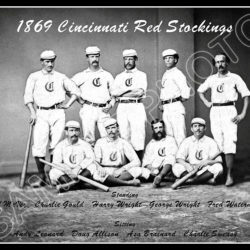 The team was called the Cincinnati Red Stockings. In regard to diet, eat hearty. Roast beef rare will aid, live regularly, keep good hours and abstain from intoxicating drinks and tobacco. You must be a sure catch, good thrower, strong and accurate, a reliable batter, and a good runner, all to be brought out by steady and persevering practice. Wright paid all the players. His younger brother, George, was the shortstop and he was paid $1400 for the season and he paid himself $1200 to be the manager. George was worth his salary as he batted .519, scored 339 runs, hit 59 home runs and made spectacular plays. The star pitcher was Asa Brainard and he had good control and strong concentration. The team went 65-0 for the 1869 season and the investors made $1.39 in profit for the season. This undefeated season got the attention of the townspeople and they took pride in their team and that secured Cincinnati as the baseball capital in the United States. However, only one of the players came from Cincinnati as the rest of them were paid to come in from other cities such as New York. They took time off from the “real” jobs which included two hatters, two insurance salesmen, a bookkeeper and a piano maker. The following season they branch out and win their first 27 games before they travel to Brooklyn to face the Atlantics. The Red Stockings were favored 5 to 1 to win the game as 15,000 people came out to watch the contest. Cincinnati went out to an early three-run lead but the Atlantics countered with two in the fourth and two runs in the sixth. After nine innings, the game was tied 5-5. The Atlantics were ecstatic and began to leave the field with a tie but the Red Stockings manager, Harry Wright, stated that clearly, the rules say that both teams must agree to end in a tie or it goes into extra innings. After a short discussion and possibly an argument, they decided to allow Henry Chadwick, chairman of the Rules Committee of the National Association to make the decision. He told them to continue playing. Cincinnati didn’t want a tie or to lose and things went well for them in the eleventh inning as they scored two runs. But something happened in the bottom half as the pitcher allowed a single and then the runner reached third on a wild pitch. After a few hits they Atlantics snatched the victory and they had plenty to celebrate. Cincinnati was devasted. The fans were devasted. So much so that they quit going to the games. Their team was not invincible. Investors withdrew their financial support. Players stopped getting paid. The team had to disband. Harry Wright understood it was a business and he took the best players and set up a new team in Boston. 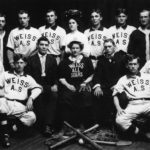 A new league was formed on March 17, 1871 on the corner of 13th street and Broadway in Manhattan and amateur baseball ended and each player was given $800 to play for the nine-team league which consisted of the Boston Red Stockings, Chicago White Stockings, Philadelphia Athletics, New York Mutuals, Washington Olympics, Troy Haymakers, Fort Wayne Kekiongas, Cleveland Forest Citys, and Rockford Forest Citys. Each team was expected to set up five games against each other and the team with the most wins were the champions.